The FCM-100™ Fan Characterization Module is a specialized unit designed to test and characterize fans of various sizes and performance outputs. Using the FCM-100™ Module in conjunction with pressure measurement equipment (such as the PTM-1000™) and velocity measurement equipment (such as the eATVS™); it is possible to develop fan curves (ΔP vs. Flow rate) that can be used to verify fan manufacturer data or to characterize fans of unknown performance. The FCM-100™ is constructed of sturdy corrosion resistant sheet metal, with casters for easy portability. A removable and customizable lexan mounting plate is provided to which fans of various diameters can be secured. 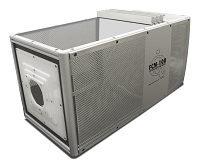 Four (4) removable perforated flow restriction plates are also provided to allow the user to control the pressure drop through the module for fans under testing. Customizable options include various sized specialized mounting plates can be made for the characterization of multiple fans simultaneously, including fan tray assemblies. The eATVS-8™ Automatic Temperature & Velocity Scanner is a portable, 8-channel hot wire anemometer system. A flexible, robust candlestick-design sensor that measures both temperature and air velocity for characterizing thermal conditions in electronic systems.